Like everything in life technology has its negative and positive attributes. While taking the module virtual environments its started to make me think more about how the development of technology has contribution to our lives today. A lot of the time I feel that my generation and the generations below me take technology for granted. We have been brought up immersed in it and its hard to remember a world that everything wasn't at our fingers tips. However, technology has contributed far beyond are day to day life and has supplied enormous help in disastrous situations. Earlier in the the semester the group of students from virtual environments visited 'Virtual Disability Island' in Second Life (www.virtualability.org). 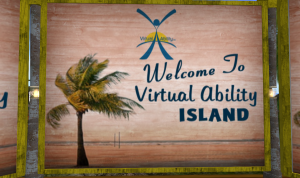 Virtual Disability Island is a support system for cross disabilities and those who are effect by individual's with disabilities. It has nearly 1000 members from a cross the world and their members may have physical disabilities, mental, emotional, and developmental. The community helps people with disabilities or effected by disabilities thrive in a virtual world. For instance a platform like this allows for someone that cannot walk in real life run free and explore in Second Life. Such technology has developed a tangible effect upon the real world. Through this community members can take place in a variety of educational and entertainment activities throughout the day. But one of the biggest things is encouraging members to explore in a world that is endless and provides a place where disabilities can be obsolete. This technology is enriching the lives of people that might not have the same opportunities in real life. But technology goes even further than this. When hurricane sandy hit the United States in 2012 many technology platforms helped in relief efforts for the devastation that the hurricane left "Mobile technology, web apps, and mapping software have become enormously helpful in sharing news and spreading information about relief efforts after Hurricane Sandy. "(1) Technology that we would not even considered to be helpful in such circumstances like Twitter and Instagram provided a great amount of information and communication during the devastating time. Such platforms also helped raise awareness and money for the cause. The Red Cross used mobile technologies to set up an app that could be used to find where the nearest shelters where, "Mobile technologies can help people find shelter information in time of need. The Red Cross hurricane app uses GPS to find the nearest shelters."(2). An article from Irin News discuses technology that can be used in disaster situations similar to that of hurricane sandy and how they can be beneficial for such circumstances. (1), (2) Forums.techsoup.org,. 2015. 'Technology's Impact On Disaster Relief'. http://forums.techsoup.org/cs/community/b/tsblog/archive/2012/10/31/technologys-impact-on-disaster-relief.aspx. I am currently a student in my final year of Creative and Cultural Industries in DIT. This course is designed to produce graduates who can function as creative managers in the creative and cultural industry sector both nationally and internationally. The course has a wide variety of subjects and over the last three years has given me a greater interested in the cultural industries and especially in communications and design. This blog has been created to document my time in 'Second life' for a my model 'Virtual Environments, Is One Life Enough? '.